The Nourishing Home - living healthier lives in service to the King! Traditional recipes for whipped cream call for ultra-pasteurized cream and refined sugar, but you can easily create a wholesome creamy topping by substituting with organic raw milk cream and pure liquid raw honey. 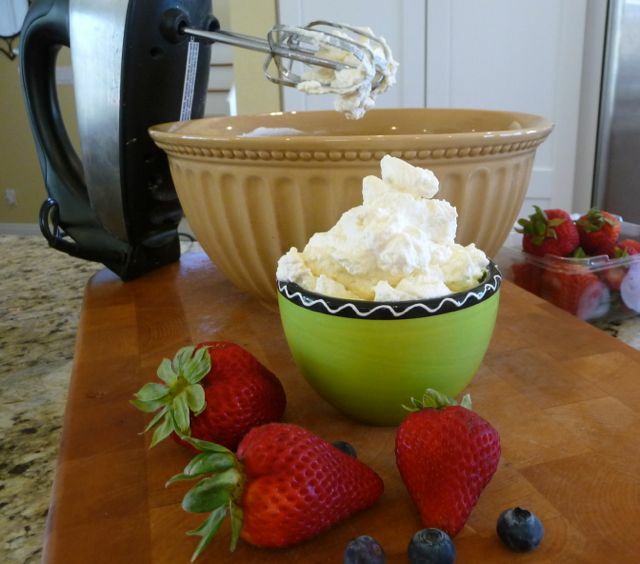 Homemade Raw Whipped Cream is the perfect accompaniment to cakes, cupcakes, pies, fruit desserts and waffles. In a medium bowl, add honey, vanilla and two tablespoons of cream. Using a hand mixer on high speed, blend until well incorporated. This creamy-delicious topping is the perfect accompaniment to cakes, cupcakes, pies, fruit desserts and waffles. 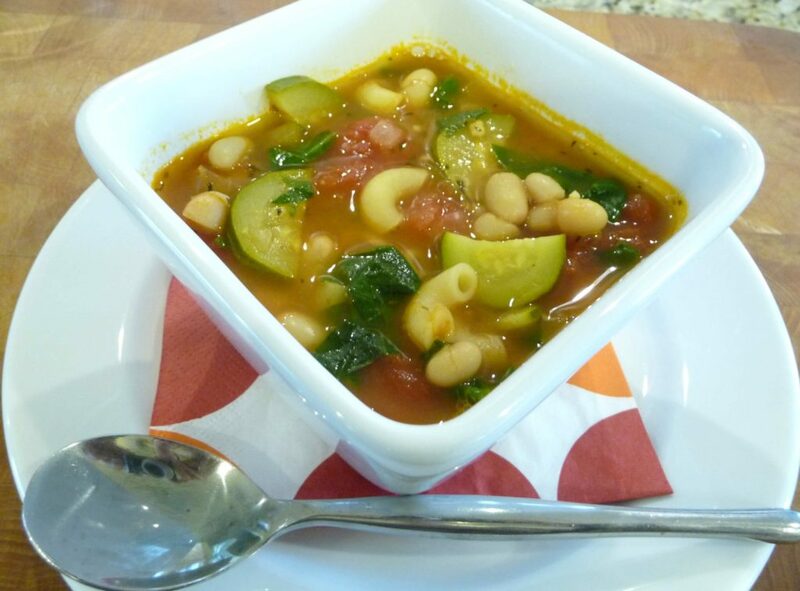 This thick, hearty soup is so easy and delicious – it’s almost like a stew! I don’t know about you, but to me, there’s nothing as satisfying as a big warm bowl of soup on a cool, crisp night. YUM! Update: Now that I’m grain-free, I replace the gluten-free pasta with zoodles instead. Learn how easy and delicious it is to make zoodles in my step-by-step “How to Spiralize“ post. In a small bowl, add 1/4 cup of beans and mash well with a fork, set aside. (This will help to thicken the soup.) Remove stems from spinach and rough chop; set aside. Heat a large stockpot over medium-high heat. Add olive oil, onion and garlic. Sauté, stirring occasionally, until onion softens and becomes translucent. Add salt, pepper, tomato paste, whole beans and mashed beans. Cook, stirring until beans are well coated with tomato paste. Add diced tomatoes with juice, water, thyme, red pepper flakes, sliced zucchini and pasta (if using). Bring soup to a boil, then cover and reduce heat to a simmer. Allow soup to simmer for 10-12 minutes, or until pasta is cooked. Turn off heat. Add chopped spinach leaves, also add zoodles, if using. Then stir and cover. Allow soup to sit about 5 minutes before serving. 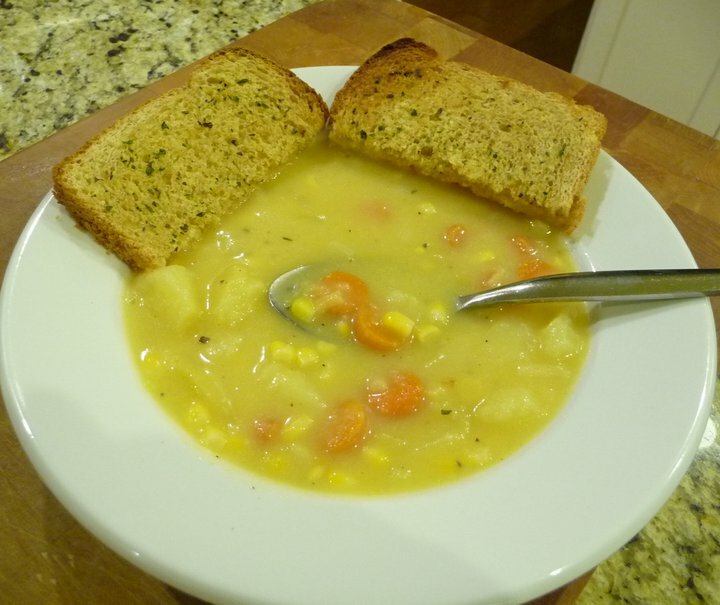 One of my hubby’s absolute favorite soups, this creamy, delicious chowder is one of the few corn recipes we treat ourselves to on occasion. Just be sure to avoid those GMOs by purchasing only organic corn! Enjoy! Heat a stockpot over medium-high heat. Once hot, add olive oil, garlic, leeks and onion. Sauté until onions and leeks begin to soften. Add diced potatoes and carrots and continue to sauté about two minutes, stirring constantly, until potatoes are well coated. Then add frozen corn and simmer about 3-5 minutes until corn is softened. In a VitaMix, blender or food processor, add about 3-4 latel-fulls of the soup and 2 latel-fulls of the broth only. Blend until soup is completely puréed. Place puréed soup back in pot. Add grated cheddar and stir, until combined. Remove bay leaves and re-season to taste using additional salt, pepper, onion powder and dried thyme. 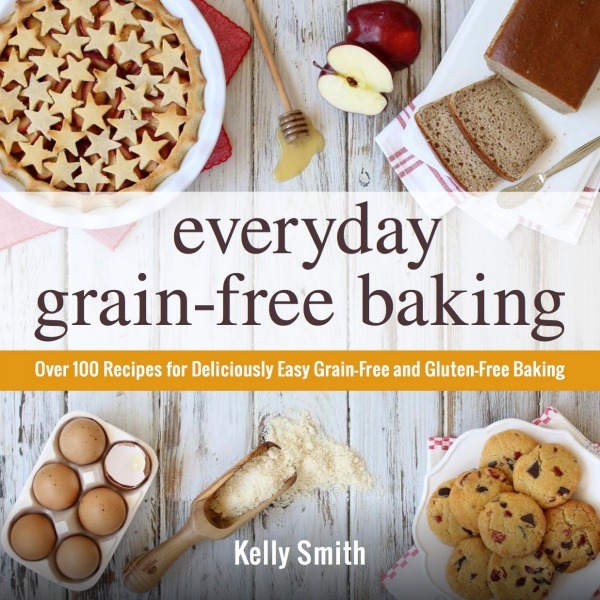 Serve with salad and sourdough rolls, or a slice of your favorite toasted GF bread! Mmm!!! Super Summer Sale! Honeyville Blanched Almond Flour as low as $3.87 per pound!